The all-electric VISION iV concept study offers a look ahead at ŠKODA’s electric future. By introducing its first vehicle to be based on Volkswagen Group’s MEB modular electric car platform, the Czech brand is taking the next step in its journey towards eMobility. The four‑door crossover coupé impresses with sporty, emotive lines and exudes a feeling of spaciousness. A dynamic driving experience is ensured by all-wheel drive and two electric motors outputting 225 kW (306 PS). The VISION iV is 4,665 mm long, 1,926 mm wide and has a height of 1,613 mm. Dynamic lines lend it a sporty appearance. Even from the outside, the interior’s spacious feel is evident from the new proportions created by a short bonnet and a long passenger cabin. The VISION iV offers a concrete preview of ŠKODA’s first production car to be based on Volkswagen Group’s MEB platform. 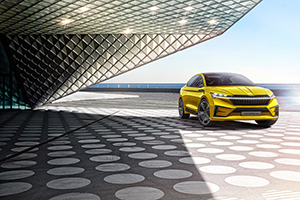 The concept car features a horizontal light strip that – running across the reinterpreted, wide, covered ŠKODA grille that has delicate vertical slats and crystalline structures – spans the entire width of the vehicle and connects the Matrix LED headlights. The athletic side view of the VISION iV is shaped by bold wings and a coupé-like roofline. The doors do not have any handles – just a touch will open them automatically. Classic wing mirrors have been replaced by cameras providing a 180-degree view which is relayed in the rear-view mirror. The multi-level arrangement of the instrument panel and centre console as well as a seemingly floating screen add a new dimension to the interior. The zero-emission ŠKODA VISION iV is powered by two electric motors – one on the front axle and one on the rear axle – giving the VISION iV all-wheel drive. The power of 225 kW (306 PS) is distributed to the wheels depending on requirements, thus providing a dynamic yet safe driving performance. The car has a maximum range of 500 km in the WLTP cycle; the battery can be charged to 80 per cent in just 30 minutes. Through the use of laser scanners, radar sensors and cameras, the concept car can perfectly navigate its surroundings. In suitable situations it can even drive autonomously and park by itself. Comprehensive connectivity features allow for direct communication with other road users, cars and the infrastructure. The latest-generation infotainment system provides access to ŠKODA’s numerous mobile online services and is not only able to master gestures and voice command but also to fully integrate the driver’s and front passenger’s smartphones into the operating concept. Using the smartphone as a digital key, the VISION iV can be unlocked and started. The concept car also monitors the driver’s heart rate, thus offering increased safety, and, if necessary, brakes automatically to come to a complete stop. The VISION iV is a concrete preview of the models in ŠKODA’s future electric range. It features a light strip that runs across the radiator grille and spans the entire width of the vehicle, connecting the Matrix LED headlights. The VISION iV’s minimalist design accentuates how easy it is to get to grips with electric cars in everyday life. Sporty and dynamic lines embody the joy of driving; the generous feeling of spaciousness distinguishes the concept study as a true ŠKODA. The multi-level arrangement of the instrument panel and centre console as well as a seemingly floating screen add a new dimension to the interior. replaced by cameras providing a 180-degree view which is relayed in the rear-view mirror. The aerodynamically optimised 22-inch wheels appear open and lightweight. One of the spokes on each wheel bears illuminated ŠKODA lettering. The front is characterised by the reinterpretation of ŠKODA’s typically wide, covered grille, featuring delicate vertical slats and illuminated crystalline structures. A prominent horizontal light strip in the upper part of the grille connects the arrow-shaped main headlights that shine with innovative Matrix LED technology. The headlights resemble three glass jewels and other brand-typical crystalline elements. Large, striking air ducts in the front bumper emphasise the car’s sporty appearance. The distinctly sculpted, short bonnet bears an illuminated crystal ŠKODA logo. From the outside, the long passenger compartment hints at the generous amount of space available inside. Furthermore, the boot has a total capacity of 550 l. Aerodynamic trailing edges and crystalline LED tail lights can be found at the bold rear. These redefine the ŠKODA-typical ‘C’ shape and, along with a strip of lights above the rear diffuser, accentuate the car’s width. Another eye-catching detail on the slightly curved lip of the electric tailgate is the ŠKODA lettering – the individual letters illuminate in red. The VISION iV’s interior echoes the design of the VISION E concept study and further enhances it. It is a role model for future electric cars from the Czech car manufacturer. ŠKODA designers have made use of the lack of a classic transmission tunnel to give the instrument panel and centre console a striking new arrangement. This lends the interior a particularly spacious feel. The lowest level offers plenty of storage space between the driver and front passenger seats. Above this, there is a movable and particularly easy-to-reach centre console. This provides space for control units and two mobile phones, which can be wirelessly integrated into the infotainment and operating systems, and charged inductively. The instrument panel consists of two levels that are delicate and light. It continues the shape of the vehicle’s front; decorative stitching and ambient lighting also accentuate these lines. The large screen appears to float in the centre above the instrument panel; there is a hand rest in front of it for use while operating the touchscreen. The exquisite, soft-foam surface with its specific texture resembles crystalline structures and will be used in all ŠKODA cars in future. Ultrasuede®, a synthetic suede fabric, rounds off the instrument panel and door trims. Ultrasuede® is a premium material which is manufactured in a particularly eco-friendly way. The lower level of the instrument panel features striking decorative birch veneers with a matt finish that are extremely ductile and strong yet lightweight. These replace the classic air vents and create a sense of a natural flow of air. The wooden slats span virtually the entire width of the interior and are proof of the ŠKODA designers’ attention to detail. This is also evident in the illuminated door handles, the shape of which resembles those found in classic ŠKODAs such as the POPULAR. The airy feel and the generously spacious interior of the ŠKODA VISION iV are accentuated even further by a panoramic glass roof. The VISION iV’s steering wheel also boasts a new design. It features just two spokes and ‘ŠKODA’ in block lettering instead of the usual ŠKODA logo; below it, a metal brace echoes the front of the vehicle. Buttons and particularly well-crafted knobs that appear to float on the steering wheel are both exquisitely designed and simple to use. The driving mode can be selected on the steering wheel; thus, all controls can be found together in one central position, in easy reach of the driver. The particularly lightweight swivel seats also contribute to the airy, spacious feel. The seats are covered in Dinamica®, a suede substitute that does not contain any animal-derived components, and includes perforations that shimmer with golden accents. Dinamica® is partially made from recycled polyester, which is also used for T-shirts and plastic (PET) bottles for example. Recycling polyester reduces CO2 emissions by approx. 80% compared to the production process using conventional materials. The backrests boast covers made from vegan vinyl fibres, whilst seat inserts feature a unique perforation pattern with golden accents. The footwell is covered by tufted floor mats made from pure bio-degradable wool. The ŠKODA VISION iV impressively combines zero-emission driving with the highest level of dynamics. The concept study is the first ŠKODA to be based on Volkswagen Group’s MEB modular electric car platform and running purely on an electric battery. It is powered by two electric motors that deliver a total of 225 kW (306 PS). The car has a maximum range of 500 km in the WLTP cycle, and the lithium-ion battery can be charged to 80 per cent in just 30 minutes. Intelligent all-wheel drive provides a safe yet dynamic driving performance. For the VISION iV, ŠKODA has drawn on Volkswagen Group’s MEB modular electric car platform. The zero-emission car is powered by two electric motors – one on the front axle and one on the rear axle. This means the car features all-wheel drive that can react according to the current situation. The car’s power output is 225 kW (306 PS) and it has a top speed of 180 km/h. Thanks to maximum torque being immediately available at all times, the VISION iV can reach a speed of 100 km/h from a standing start in just 5.9 seconds; the short burst from 80 to 120 km/h takes less than 4 seconds. The car also boasts a maximum range of up to 500 km in the WLTP cycle. In the MEB platform, the high-voltage battery lies compactly between the front and rear axle in the car’s underbody, where it is also optimally protected. The liquid-cooled lithium-ion battery has a capacity of 83 kWh and can be charged to 80 per cent of its total capacity in 30 minutes. The car can be charged using a cable. The flow of energy between the two motors and the battery is controlled electronically. Intelligent electronics also take care of power distribution for the all-wheel-drive system. When accelerating, they ensure optimal traction for all four wheels. While doing this, the car’s continuous and simultaneous management adapts to the needs of the driver as well as to the individual conditions and given situations. Thus, the intelligent all-wheel drive always provides the maximum level of dynamics, driving stability and safety. The ŠKODA VISION iV uses innovative technology to improve the safety and comfort of its occupants. The car is fitted with various laser scanners, radar sensors and cameras, allowing it to navigate its surroundings and respond accordingly. In addition, the concept study’s comprehensive connectivity features allow it to exchange information directly with other road users and cars as well as with the infrastructure. In certain situations, this means the ŠKODA VISION iV is able to drive autonomously or park itself. ŠKODA has equipped the VISION iV with technology for a new level of safety and comfort. Comprehensive connectivity features enable the car to communicate with other road users and vehicles as well as with infrastructure such as traffic control centres, meaning the car can respond to what is happening in traffic quicker and more precisely. In addition, numerous assistance systems support the VISION iV when either the driver is behind the wheel or it is driving and parking autonomously. ŠKODA VISION iV can also communicate with infrastructure. The ŠKODA VISION iV is equipped with the latest-generation infotainment system. It provides access to ŠKODA’s numerous mobile online services including Infotainment Online and Care Connect. If desired, the system can be operated using voice command, gestures or the occupants’ smartphones. These devices are integrated directly into the concept study’s infotainment system using the innovative centre console. Smartphones can now also be used as a digital key for unlocking as well as starting up the VISION iV. speech recognition with online support – can understand entire sentences and even dialects. Online provides Online Traffic Information in real time, weather reports or information about available parking spaces, for example. Care Connect includes Proactive Service and remote vehicle access via the ŠKODA Connect app or web portal. A premium sound system ensures the car’s occupants experience perfect acoustics, and the VISION iV itself monitors the well-being and safety of the driver. For example, the car detects when the driver’s concentration is waning by monitoring the movement of their eyes. It can also keep track of their heart rate – alerting the driver if it is at a dangerous level or, if necessary, automatically and safely bringing the vehicle to a stop. Ah yes, you have to be stationary before that option becomes available. And the keyboard disappears as soon as you start moving. 2017 Skoda Yeti Roof Antenna 6R0035501D on 2011 passat? Re: ---Reset service light with VCDS - Need help on how? Crasher, I have gone through all your posts on our forum and I am not finding any where you spoke to this issue. Do point me to it please. You have to take the timing belt off to chnage it The sensor is 03L 957 147 A and costs £41.57 from a VW van centre.